There are many women of substance in our society whose contributions over the years go unrecognised or simply are not duly highlighted. And there are many outstanding women of Guyana’s soil who are deserving of immense recognition. Their contributions understandably cannot be adequately portrayed in the limited pages of a publication such as this, for they are so remarkable. However, just for today, we will seek to recognise four daughters of the soil, who recently received accolades for contributions they made towards developing the Arts in Guyana. The work of Dr Doris Elrina Rogers, Mrs Meighan Steele-Duke, Mrs Vivienne Daniel, and Mrs Gem Madhoo-Nascimento was particularly emphasised when the Institute of Creative Arts, which falls under the purview of the Ministry of Culture, Youth and Sport, hosted its inaugural Convocation at the National Cultural Centre last month at which a total of 58 students graduated. Regarded as ‘legends’ the four were presented with lifetime awards, owing to their unselfish and transformative contributions to Guyana. And so it was a vital part of the Convocation ceremony to have their individual works amplified in order to showcase some of those who were instrumental in bringing life to the Arts in Guyana. Dr Rogers, who has a vast academic background, has been classified as a painter extraordinaire, a Professor of Art and Art Educator, who was honoured with the status of Professor Emeritus by the University of Guyana following her retirement from that institution in 2008. She however started her career in Rose Hall and Port Mourant in Berbice as a teacher of Science before seizing the opportunity to study Art. The switch from the Sciences to the Arts was to pay very high dividends for the nation, as she went on to make monumental contributions in the fields of Fine Arts, university administration, research in art, and especially, in art education. She graduated as a Trained Teacher First Class and studied Art and the teaching of Art after being awarded a UNESCO Fellowship to the South Australia School of Art. She then studied Art at Howard University followed by a Doctorate in Art Education at Penn. State University. During this time she also accumulated a considerable depth of experience and established her professional life. Her overseas career also saw her assuming the position of Programme Coordinator at the Paul Robeson Cultural Centre, Instructor in Art Education at Pennsylvania State before moving on as a senior academic at the University of Benin in Benin State, Nigeria from 1981 to 1988. Upon her return to Guyana she served as Art Specialist to the Ministry of Education and taught at The Bishops’ High School after which she started her distinguished service to the University of Guyana in 1988. 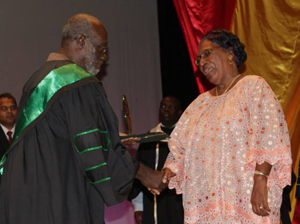 Her unique contribution to the development of the university includes her design and introduction of the Bachelors of Art Degree programme in Fine Arts in 1990, and the important establishment of Art Education on both the Turkeyen and Berbice Campuses while she was Coordinator in the Division of Creative Arts from 1988 to 2003. Because of Dr Rogers’ input, the external image of the university was advanced and the quality of its graduates deepened by her initiation of the summer attachment of final year Art students at Toogeloo College, Mississippi, for exhibition and workshops, as well as annual public Exhibitions by University staff and students. Professor Emeritus Rogers’ value to the institution and to the nation was also enhanced by the fact that she is an exceptional painter, celebrated among the foremost national artists of Guyana, who has researched the art and its techniques in Nigeria, and has been exhibited extensively in India, Nigeria, Guyana and North America. Of pointed relevance to the honour she was recently bestowed by the Institute of Creative Arts is the specific way in which Dr Rogers established the Bachelors Degree in Art at the University to allow graduates of the Burrowes School of Art to complete a full degree at UG in two years. This articulation was an important collaborative step in the network of tertiary institutions offering programmes in the creative arts. 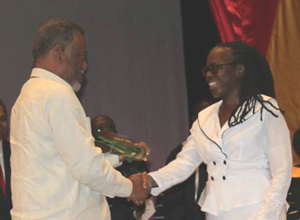 developmental way, music, the teaching of music, broadcasting and distance education for the enhancement of music in Guyana, that Mrs Meighan Steele-Duke was recognized by the Institute as yet another Lifetime Fellow. Duke’s involvement in Educational Broadcasting began at an early age in the 1960s when she was employed as a Clerical Assistant in the Broadcast to Schools (BTS) Unit of the Ministry of Information. Her interest and love of music enabled her to give advice to Senior Producers on appropriate musical selections. When the BTS Unit was formalised in 1965, Meighan became a full-fledged producer of educational broadcasts with the focus on the accurate dissemination of information, attention to the spoken word and the use of music to enhance educational programming. This was the background, the foundation and the launching pad for a noted and exemplary career in music education through broadcasting, training and practice that was to leave its everlasting mark on music and music education in Guyana. Duke was appointed Schools’ Broadcasts Organiser and helped the concept of Distance Education in Guyana, because of her belief that educational programmes reaching from the Rupununi to Skeldon could bring curricula reform to teachers, pupils and the wider community. During the 1980s she met with Distance Education specialists while attending Conferences or Training Programmes in Guyana, the Caribbean, United Kingdom and Canada and was given the opportunity to increase her knowledge on integrating Distance Education into schools’ curricula. The GUIDE (Guyana In-Service Distance Education) programme, initiated by herself and Ms Florine Dalgetty, provided official certification for untrained teachers from several regions. And Mrs Duke also taught Language Arts, French, English Literature, Dancing and Music and has prepared a National Songbook of Guyanese Songs under commission from the Ministry of Culture, Youth and Sport. An active member of St Andrews Presbyterian Church Choir and the Woodside Choir for over 40 years , she is also an executive member of Korokwa Folk Group, an offshoot of Woodside. She is now involved in voluntary teaching to children in need and presents a Singing by Radio Series for Broadcast to Schools, within the National Centre for Educational Resource Development (NCERD) which emphasises her continued contribution to the land of her birth. choreography, dance theatre and theatre production, as well as in the training of others, Mrs Vivienne Daniel was also admitted as a Lifetime Fellow of the Institute. She has been involved ‘formally’ in dance under the Department of Culture since 1973 when she became a Student of the Advanced Class of the National School of Dance. She graduated with Distinction in the first batch of ‘Trained Dance Teachers’ in 1974 and in 1978 she represented Guyana at the Ballet Festival in Cuba as – Artista Invitada. Thus began the national career of a dancer, a dance teacher, a theatre director and manager and a choreographer of the highest order, led by one who has become a main supporting pillar in Guyanese dance theatre. Daniel has performed nationally and internationally in Cayenne, Suriname, Trinidad, Barbados, St. Lucia, Dominica, Cuba and Canada. In 1979 she became a Founder-Member of the National Dance Company and received specialist training in the planning and conducting of auditions as well as specific assessment procedures for the selection of prospective students for classical ballet. From 1980 onwards, Daniel has shared her skills extensively through the training of others in dance, and was appointed Co-ordinator of the One Year Dance Teachers’ Certificate Training Programme as well as a tutor for courses in Modern Dance, Choreography, the History of Dance and Research. She is also Dance Educator-Resource person attached to the Unit of Allied Arts, Ministry of Education, Tutor for the Caribbean Secondary Education Certificate (CSEC) Theatre Arts and Lecturer in Dance and Movement at The National School of Theatre Arts and Drama. She is currently the Director of The National Dance Company, which she has guided as an artistic leader, mentor and visionary, and is Senior Instructor at The National School of Dance. Daniel also conducts posture classes for The Physiotherapy Department for persons with scoliosis. Her efforts over the years have seen her being the recipient of the Theatre Arts Award for Best Director; the Award of the International Dance Day Committee (Guyana) for selfless contribution and outstanding dedication to the performing arts; Artistes in Director Support-celebrating 20 years of service (Award) for outstanding contribution and support; the Rehabilitation Services of Guyana – Dedicated Service Award – in recognition of outstanding and dedicated service; Metro Toronto Caravan (Canada) – for contribution re Guyana’s Cultural Heritage through the performing arts, and the Guyana Cultural Association NY Inc. – Guyana Folk Festival Award in recognition of outstanding contribution to Guyana’s Cultural Heritage. 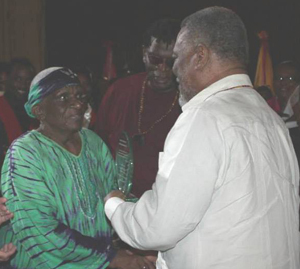 Moreover, the Guyana Institute of Creative Arts was compelled to recognize Daniel’s lifetime career that has “truly shaped, developed and guided dance in Guyana” even as she rose to the status of being the nation’s foremost, most outstanding and influential choreographer. Mrs Gem Madhoo-Nascimento accepting her award. admitted as a Lifetime Fellow of the Institute of Creative Art. 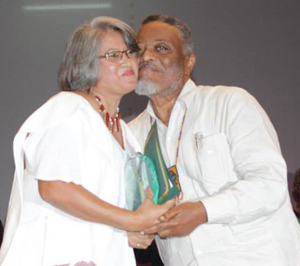 She started her theatrical life in 1973 with the PSU Drama Group, and continued it with outcomes of significant proportions when she joined the Theatre Guild of Guyana a few years later. It was as a member and an executive officer of the Guild that she honed and developed her own craft in the theatre and began a career that was to contribute to the growth of the professional theatre in Guyana and the training and development of several others on the Guyanese stage. A former banker with training in accountancy, she used these skills to become a pioneer in professional theatre. Madhoo-Nascimento has been able to guide many amateur performers into becoming paid professional artistes, since 1981, with the formation of The Theatre Company. In partnership with Ron Robinson, she co-founded and managed The Theatre Company, the first professional performing company which opened doors, thus contributing substantially to the definite development of the modern era on the local stage. She has been jointly responsible for The Link Show the longest running, most popular and most successful production in Guyanese theatre, and has managed several overseas tours to the Caribbean and North America. Today Madhoo-Nascimento owns and manages GEMS Theatre Productions and GEMS Youth Theatre. She has used theatre to raise funds for many charitable and sporting organisations, staged productions in recognition of International Women’s Day, given visual artists exposure through theatrical productions and harnessed a young group since 2007 into ‘edutainment’ in a number of schools and performing at venues regionally. She has participated in and received training from international fora and workshops such as the Eugene O’Neill Theatre, and has contributed regionally to Theatre Information Exchange of the Caribbean. Madhoo-Nascimento brings to the theatre industry over 40 years of experience and in excess of 200 productions on a Guyanese stage whose high profile, prolificity and professionalism she has helped to build. She was recognised with the YWCA’s ‘Women of Distinction’ Award in 2002; the 2006 Guyana Folk Festival Award – ‘In recognition of outstanding contribution to Guyana’s Culture and Heritage’.